ROADS: The state’s 32.9-cent gas tax would go up 8 cents, but the state’s minimum mark-up law on fuel that results in a roughly 9 percent increase in the price of gas would be eliminated. Gas taxes would automatically increase with inflation. Evers said the net effect could be a par-gallon decrease of as much as 14 cents. Heavy truck registration and new car titling fees would increase, but the $75 vehicle registration fee most car owners pay would not change. Borrowing for roads would be the lowest level in 20 years, while $320 million in new money would go toward highway repair and expansion. LAME DUCK: Most of the law changes approved by Republicans during a December lame-duck legislative session that weakened powers of the governor and attorney general would be repealed. That includes changes that required legislative approval to withdraw from lawsuits or settle lawsuits, the governor’s powers to make rule changes and restrictions on his influence over the state’s economic development agency. UNDO WALKER: Wisconsin’s “right-to-work” law would be repealed, and prevailing wage requirements would be reinstated. Both changes were fought by unions when enacted under former Republican Gov. Scott Walker. The budget would also undo work and drug testing requirements Walker instituted to qualify for food stamps, qualify for Medicaid and other public aid programs. MARIJUANA: Medical marijuana would be legalized and possessing up to 25 grams of recreational pot would be de-criminalized. The plan appears to be a non-starter among Republicans. AUTOMATIC VOTER REGISTRATION: State elections officials are required to work with the Department of Transportation to implement automatic voter registration as soon as possible. Sixteen states have automatic voter registration. As people apply for or renew a driver’s license they’re either automatically registered to vote or asked whether they would be automatically registered. K-12 SCHOOLS: Funding for K-12 schools would increase by 10 percent, or $1.4 billion, and the complex state aid formula would be rewritten. The state would pay at least two-thirds of school costs through aid, and a ban on how many times a district could ask voters to exceed local property tax limits would be repealed. VOUCHER SCHOOLS: Enrollment in voucher schools would be frozen starting in 2021, a move Republicans oppose. Evers would also do away with an income tax deduction for private school tuition, which would raise about $12 million a year. HIGHER EDUCATION: A tuition freeze at the University of Wisconsin would continue for at least two years, with overall funding increased by $150 million. Residents of other countries who have graduated from a Wisconsin high school, spent at least three years attending a Wisconsin high school and are pursuing U.S. citizenship could pay in-state tuition at UW schools and state technical colleges. Republicans oppose the in-state tuition plan, a version of which they stripped from state law in 2011. DRIVER’S LICENSES: The budget would make people who are living in the country illegally eligible for driver’s licenses and identification cards. TAXES: Income taxes for the middle class would be cut 10 percent. He would also limit a 30 percent capital gains exclusion to single people earning less than $100,000 and couples earning less than $150,000. That would bring in $500 million over two years. A new child care tax credit equal to 50 percent of the same federal credit would be created. First-time homebuyers could subtract up to $5,000 a year, $10,000 for married couples, in accounts to pay for home purchases that would grow tax-free. E-CIGARETTES: The budget would impose a tax on all e-cigarettes and vaping products equal to 71 percent of the product’s list price. The tax rate mirrors the existing rate on traditional cigarettes and other tobacco products. PROPERTY TAXES: Property taxes would increase on average $50 in each of the next two years on the median-valued home. That’s a 1.7 percent increase. The median-valued home is $173,646. 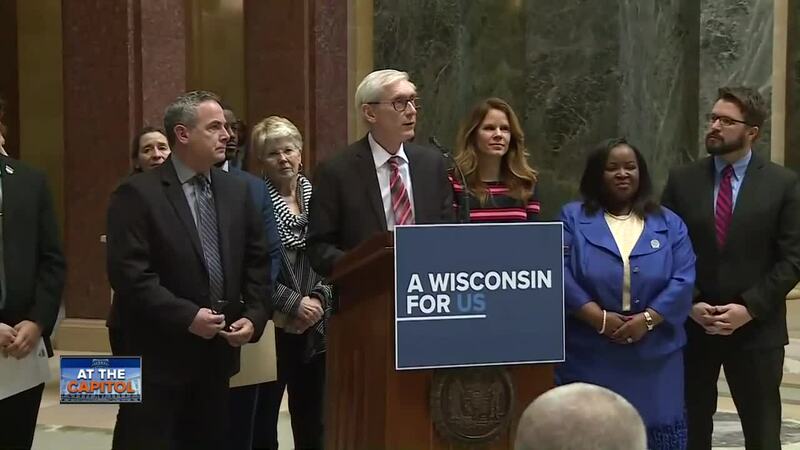 HEALTH CARE: Evers would accept federal Medicaid expansion , a move that would add about 82,000 low-income people to Medicaid and save the state about $320 million over the next two years thanks to an infusion of federal dollars. But Republicans have been outspoken against it, saying putting more people on Medicaid will shift costs to the private sector and ultimately cost the state more in later years. CORRECTIONS: The budget doesn’t set aside any money for building a new prison to deal with overcrowding, but it does call for building an additional barracks at two prisons to house more than 400 inmates. The budget also would establish a new pay progression for guards and bump starting pay from about $16 an hour to $18. Evers has said he wants to reduce the overall population but the budget doesn’t include any early release initiatives that would accomplish that. YOUTH PRISON: Evers calls for indefinitely delaying closure of the troubled Lincoln Hills juvenile prison, while spending nearly $200 million more on smaller replacement facilities. He also called for raising from 17 to 18 the age that offenders are considered adults for most crimes. NATURAL RESOURCES: Evers wants to borrow nearly $70 million more over the next two years to combat water pollution and replace lead pipes. He also proposed adding five scientists at the state Department of Natural Resources to research water pollution and five positions to regulate factory farms. DARK STORES: Evers calls for closing the “dark stores” loophole that allows big box retailers to save millions of dollars in property taxes by assessing the value of their active stores as if they were vacant. PLANNED PARENTHOOD: Nearly $28 million would be spent to support women’s health care issues, including restoring funding available to Planned Parenthood that was blocked by Walker. REDISTRICTING: Evers proposed a nonpartisan redistricting process that would take away the Legislature’s power to draw political boundary maps, a move he said would stop partisan gerrymandering. Republicans support the current process. The next round of redistricting will occur after the 2020 census. ECONOMIC DEVELOPMENT: Evers campaigned on defunding the state’s job-creation agency, the Wisconsin Economic Development Corp. But since winning election, Evers backed off on eliminating WEDC and instead will propose tightening restrictions on tax breaks it gives companies. MINIMUM WAGE: Evers campaigned on raising the minimum wage to $15 an hour. His budget would increase the minimum wage by $1 to $8.25 beginning in 2020, and raise it to $9 an hour in 2021. It would then go up 75 cents per year in each of the next two years, and then it would go up according to inflation every year after that. CLEAN ENERGY: The budget calls for eliminating coal from all electricity production in Wisconsin by 2050. CRIME ANALYSTS: The budget gives Attorney General Josh Kaul money to create 17 more crime lab analyst positions and sets up a pay progression for lab workers. The labs have been plagued for years by slow turnaround times for evidence test results. STATE WORKERS: State employees would see a 2 percent across-the-board raise in each year of the budget. TOTAL BUDGET: Spending under the $83.4 billion, two-year budget would increase 5.4 percent the first year and 4.9 percent the second. The state’s $616 million budget surplus would be just $20 million by mid-2021 under the Evers plan.